As I work with my clients, I strongly suggest working with a registered dietitian during recovery. There are times when questions surface during session can be better answered by a dietitian rather than an eating disorder therapist. Dietitians are an integral part of an eating disorder treatment team. Registered dietitians are educated professionals who know about not only food but also the way nutrition interacts with our unique bodies along with how nutrition can help improve our overall wellbeing. Families and eating disorders are challenging to navigate! 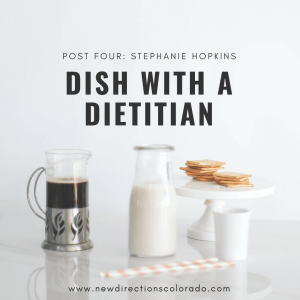 Boulder Registered Dietitian helps answer questions from individuals who struggle with disordered eating and eating disorders. My toddler is in a stage where she just wants yogurt and I feel like she needs more than just one food. Do you recommend any resources for parents on what is considered “normal eating” with children? Normal eating is going to the table hungry and eating until you are satisfied. It is being able to choose food you like and eat it and truly get enough of it -not just stop eating because you think you should. Normal eating is being able to give some thought to your food selection so you get nutritious food, but not being so wary and restrictive that you miss out on enjoyable food. Normal eating is giving yourself permission to eat sometimes because you are happy, sad or bored, or just because it feels good. It is leaving some cookies on the plate because you know you can have some again tomorrow, or it is eating more now because they taste so wonderful. Normal eating is overeating at times, feeling stuffed and uncomfortable. And it can be undereating at times and wishing you had more. Normal eating is trusting your body to make up for your mistakes in eating. Normal eating takes up some of your time and attention, but keeps its place as only one important area of your life. In short, normal eating is flexible. It varies in response to your hunger, your schedule, your proximity to food, and your feelings. I also help families find their own way to normal eating so they can help to raise normal eaters in their house. The way that we raise normal eaters is by adopting the division of responsibility at the very beginning of eating/feeding with our kids. The short explanation of the division is that there are 2 separate jobs: the feeding and the eating. The parent/family is responsible for the feeding and the child is responsible for the eating. This means that the parent/family provides structured meals and snacks that include a variety of foods (the what, when and where of the feeding). Once that part is done, the child does their job – which is the eating (how much and whether), without pressure or underlying motives from the parents/family. These are all examples of pressure being put on a child to eat a certain way that is deemed “right.” The typical outcome of pressuring a child during mealtime is the opposite of the intended outcome. Pressure to eat more will result in eating less. Pressure to eat less (usually of certain foods) will result in the child wanting to eat more of those foods, and could ultimately result in hiding or sneaking food. I know that sweets are my trigger foods, and that if I have them in the house, I feel like it’s all-or-nothing right now. How can I teach my children along with myself the concept of “moderation” and that these are not bad or forbidden foods? I don’t want to set them up for unhealthy relationships with food and their bodies like I was by my parents. Such beautiful awareness that you don’t want to set up your children for an unhealthy relationship to food or their bodies! I applaud you. When it comes to those foods that make you feel “out of control,” there is a common belief that abstinence is the answer. The thought being “if I can’t control myself, I’ll just keep those foods out of my life.” The problem with this plan is that it isn’t realistic, sustainable, or a very peaceful way to deal with food. The feeling of out of control around food most often happens because we’ve deemed certain foods as “bad, unhealthy, guilt worthy, fattening.” When food holds that much power, our brain fixates. If I tell you not to think about a purple elephant – what are you going to do? Think of a purple elephant right? After this initial “honeymoon period” of eating those foods neutrally and without judgment, our body will find a balance and we’ll start to seek out a variety of different foods, including some of those foods that were previously trigger foods. Moderation becomes something that just happens, rather than something we have to focus on. The same goes for your kids. Having kept the division of responsibility clear throughout their life they will be able to manage all foods. If you’ve put certain foods on a pedestal, they will most likely feel restricted and eat more of those foods than they would if they had remained a neutral part of their eating plan growing up. To neutralize certain foods that have been put on a pedestal, the best way to do that is to offer an unlimited amount during a snack time. This way it doesn’t compete with other foods at the meal, but it also allows your child to eat as much or as little of the food as they want. There may be a bellyache or two. Don’t fret. Trust your child to understand what’s happening and adjust accordingly next time. Resist the urge to put pressure on them to eat less or more of something. Even questions like “are you sure you want more of that?” tend to backfire. If you must say something keep it related to how their body feels: “does your tummy feel empty or full?” Let them make the connection themself. I am consistently amazed at how in tune a child is with their body and needs. If you are doing your job with the feeding, and you let the child do their job with the eating, the nutrition will work itself out overtime. How do I help my teenage daughter to eat more healthy options without making her feel bad about herself? We eat dinner and sometimes she wants 2nds or 3rds with meals like Mac & Cheese but will not eat the veggies or the meat. I want to help her eat “right” without restricting! The most important message to send to your daughter is that there is no right way to eat, and no right way to have a body. Eating is one of the most intimate aspects of human life. There are no two humans who will eat exactly the same way. And even if they did, they wouldn’t look the same or have the same body! If you’ve followed the division of responsibility discussed in the previous question your teenage daughter will be a competent eater who is able to manage her eating mostly on her own. Don’t rule out the importance of a family meal though! Sitting down with your children is one of the most beneficial things a family can do. If there has been an interruption of the division along the way, it’s very likely that your daughter is feeling the effects of restriction of certain foods that have been put on a pedestal because they’ve been deemed “unhealthy.” If this is true, don’t worry, a simple conversation can be the beginning of changing the pattern. By reassuring our kids (in this case a teenager) that we aren’t going to try to manage the how much and the whether of their eating we can turn the trust back over to them and their own body. By telling them that all foods fit, are neutral, and have a place at the table, they will naturally find their way to a balanced style of eating for them. If we continue to push and pressure them to eat certain foods more, and certain foods less, the most likely outcome is the opposite of what we want. And this is such a tender age for developing disordered eating behaviors it may push them in a dangerous direction. Trust your teenager to feed herself. Sit down to meals together and be good company. Neutralize the language around food and bodies. Include her in meal planning, and encourage her to cook. Don’t restrict her. There may initially be a “backlash” if certain foods have been restricted, but eventually if you trust, it will even out and you will have given your daughter the gift of body trust. School is in full swing and after school activities have started. How can I create a routine with meals in my house when it feels like everybody is on different schedules? What a great question! The reality is these days families are often very busy with one or both parents working, and after school activities happening most days of the week. Families often believe the only acceptable meal to sit down for together is one that was cooked from scratch. This isn’t true! Pizza delivery, takeout or a frozen convenience meal is just as acceptable for a family meal as homemade spaghetti and meatballs. Variety over days or weeks keeps the nutrients balanced, there’s no need to nitpick on a day or meal basis about what you’re serving. The key to family meals is getting a few minutes to sit together, not to have a 5-course gourmet meal. Give yourself a break during those busy times and allow for some flexibility. I also often hear a lot of black and white thinking from families: that family meals must be every night and that every person must be present for it to count. Embrace the gray area here! If everyone can’t sit down together – can 2 people? Can 3 people? Can one person sit down twice, but only eat once or eat a small amount each time? Maybe there’s one or two days each week where everyone can eat together – make sure the whole family is aware of the expectation of family meal and encourage everyone to join in the process of planning and cooking. Never the same thing twice! My schedule varies so much that I almost never eat the same thing twice these days. I find myself deciding what to eat each day based on what I’ve had for breakfast, what sounds good in the moment, and how long it has to sustain me until my next snack or meal. You can be sure it will have a balance of starchy carbohydrates, protein, fat and fiber, or I won’t feel satisfied. Yesterday I had leftover pasta from the night before (starchy carbohydrates), with cauliflower, zucchini, tomatoes (fiber), sliced almonds, and cheese (protein and fat). It was delicious and satisfying. I finished it off with some chocolate I had in the kitchen because something sweet sounded delicious! 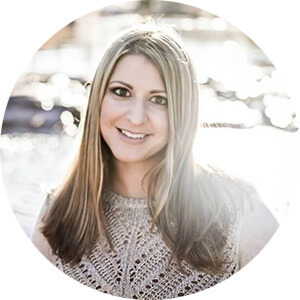 Steph Hopkins MS, RD, a registered dietitian based out of beautiful Boulder, Colorado. She specializes in helping people of all ages cultivate a positive relationship with food and their bodies. Steph offers both in-person and virtual nutrition therapy targeted to adults who are ready to end the diet cycle, and step into a world free from food rules and body obsession. She believes there is a way to honor our bodies’ inherent wisdom through self-care and compassion. She also offers counseling to families looking to cultivate a positive relationship with food and bodies for themselves and their children. Steph states, “I believe if we raise a generation of competent eaters our entire culture will change.” She goes on to explain the way we do that is by challenging our current beliefs surrounding food and our bodies to end the dangerous diet cycle that so many of us live in unknowingly. Only then will we be able to have a life free from dieting, body negativity, and disordered eating patterns. When she is not working, you’ll find her riding her horse, hanging with her 2 dogs, or doing something fun with her husband. She has lived in Boulder most of her life and offers a unique perspective on the culture there.